I'm looking at picking up a set of ESM 021's for my pre-LCI e90 and I've only seen these run on an LCI e90 which I believe has a rear track that is 8mm wider. I'm curious if this would be too aggressive for my pre-LCI e90 or not. I do plan on rolling the fenders either way if I go this route. Does anyone have any pics or info on the fitment with these specs? Also, seeing these be super fit on an LCI e90 (w/o spacers) would I just need an 8mm spacer on each side to replicate the look? Last edited by DukerHD; 03-18-2018 at 01:13 PM. 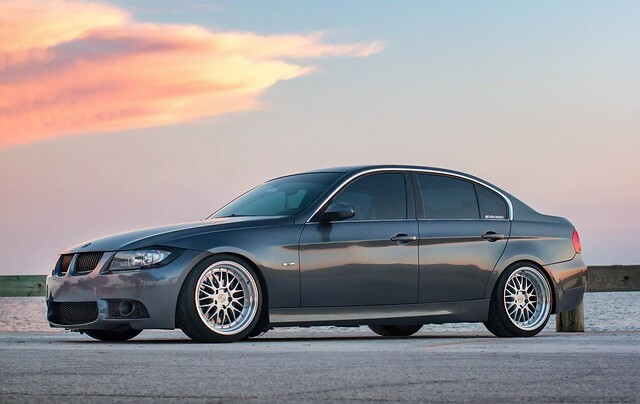 The E90 LCI is 8mm WIDER, meaning the wheels are pushed 8mm more on each side. You don't want to run spacers on that setup. You can, but I wouldn't recommend it. I'm running 18x9.5/10.5 ET22 225/255 with rolled and pulled fenders with -1.9* of camber and I'm slammed. I don't think I could go wider than 235/265 with more camber. To answer your question; Yes, it will fit. Roll and pull both fenders and trim the rear fenders in the rear where the quarter panel meets the bumper. Oh okay, I get it. Your fitment is absolutely perfect. Thanks for this! Not yet unfortunately, I found a good deal on wheels locally and am now sitting on Concept One C-8's which I believe are discontinued. I can't find another E90 with them fitted, even on Google.